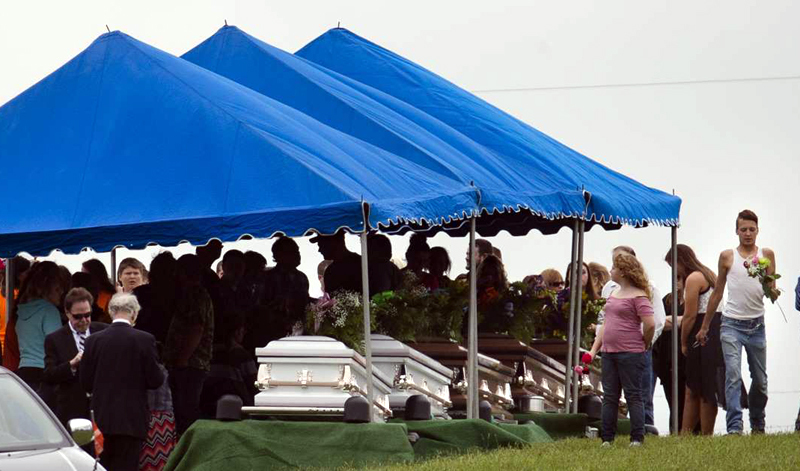 A family of four was arrested Tuesday in the gruesome slayings of eight people from another family in rural southern Ohio two years ago, the first break in a case that left a community reeling and surviving family members wondering if answers would ever come. One of those arrested was Edward "Jake" Wagner, 26, who was once the boyfriend of one of the eight victims, 19-year-old Hanna Rhoden. The others were Wagner's father, George "Billy" Wagner III, 47; his wife, 48-year-old Angela Wagner; and George Wagner, 27. The Wagners had since moved to Alaska. No motive has been announced. Police in Kentucky say the FBI tracked "Billy" Wagner to Lexington, where he was arrested without incident at around 12:30 p.m. Tuesday. Lexington police weren't sure if he had been living in the area. It's the culmination of a massive investigative effort since seven adults and a teenage boy were found shot in the head at four homes in April 2016. Authorities had refused to discuss many details about the slayings, saying they didn't want to tip their hand to whoever was responsible for the shootings. "We look forward to the day when the true culprits will be discovered and brought to justice for this terrible tragedy," Clark said in a statement. He added: "The Wagners are also very hopeful that in the ensuing months there will be a thorough vetting of all the facts." Clark told The Cincinnati Enquirer that the family was being "harassed while the real killer or killers are out there." A coroner said all but one of the victims was shot more than once, including two people shot five times and one shot nine times. Some also had bruising, consistent with the first 911 caller's description of two victims appearing to have been beaten. The coroner's report didn't specify which victims had which wounds. The victims were identified as 40-year-old Christopher Rhoden; his ex-wife, 37-year-old Dana Rhoden; their three children, 20-year-old Clarence "Frankie" Rhoden, 16-year-old Christopher Jr., and 19-year-old Hanna; Frankie Rhoden's fiancée, 20-year-old Hannah Gilley; Christopher Rhoden Sr.'s brother, 44-year-old Kenneth Rhoden; and a cousin, 38-year-old Gary Rhoden. Hanna Rhoden's days-old baby girl, another baby and a young child were unharmed. It appeared some of them were killed as they slept, including Hanna Rhoden, who was in bed with her newborn nearby, authorities said. The child, Hannah Gilley's 6-month-old baby and another small child weren't hurt. Associated Press Writers John Seewer in Toledo and Dylan T. Lovan in Louisville, Kentucky, contributed to this report.